Have you got confused with the title? ?Is it something wrongly written or have I created something healthy to satisfy the hunger of my naughty pranks? 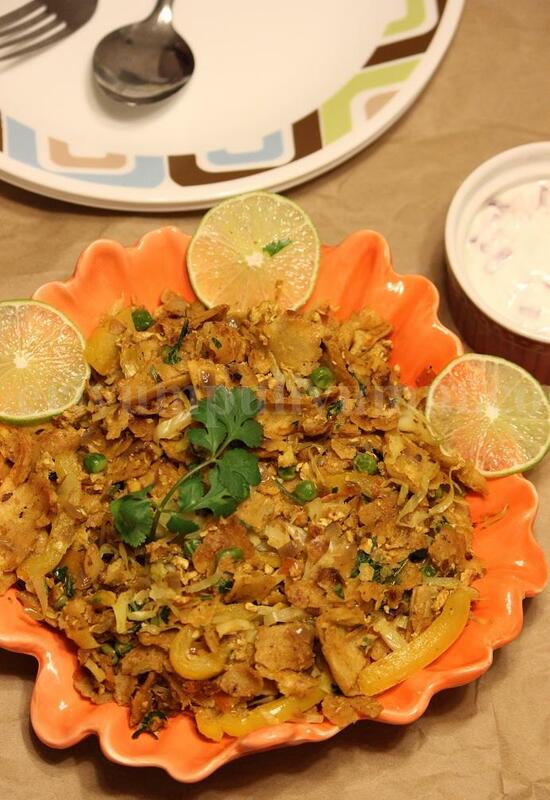 Yes..the later of it is true,basically me & my husband don't favor the kerala parottas but of course once in a while is no big question.So,I thought to try the healthier version of kothu parotta by replacing "parottas" with "chapathis",Isn't it good,friends?? And it makes a complete balanced dinner.And if you some left over chapathis at home,then this can be served a tasty quick fix alternative !! -Prepare chapathis as you regularly do,smear a little oil or ghee on top.Roughly chop them in small bits,keep aside. -Heat oil in a pan and saute onion till translucent and then add the ginger-garlic paste.Saute till the raw smell disppears. -Add in the thinly sliced cabbage, capsicum & peas.Saute till its cooked 3/4th,add a little salt. -Add one of the tomato chopped,the spice powders and toss well.Cook covered for 5 mins on medium flame until the tomatoes becomes mushy and coats the masala. -Add in the two eggs and scramble them.Adjust salt now. -Add in the roughly chopped chapathis,sprinkle the water.Add the left out tomato and cilantro leaves.Mix everything well. -Cover and leave for 2 minutes,then serve hot just like that or with some lemon wedges or raitha !! *You can make the same with parottas too just replace the chapathis with parottas.Smearing oil on top of chapathis makes them soft and adds a taste.You can skip that if desired. *You can add any veggies of choice.I used a yellow capsicum in the recipe,you can use any color one. * Adding one tomato at the end gives a nice crunch to bite,if you aren't comfortable this way you can add that tomato along with the first one listed. * You can even add any left out chicken curry/other curries to make the same,in that case you can remove all the spice powders listed.Add pepper powder & adjust spices accordingly . This is my favorite breakfast with leftover chapatis. I don't this many stuff but your way is very nice too. 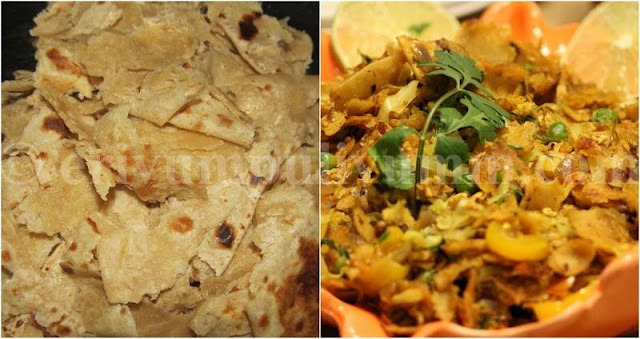 We have parottas once in a while only.. but chappathi almost every other day.. this will be great for leftovers or just to make chappathi more intertesting... love this preparation.. yum! looks very tempting dear...lovely presentation!! one of the best leftover recipe.. looks too yumm with addition of veggies it makes a goo dmeal.. Awesome Julie, even I do this, making it a little healthier.. Loved your chapathi preparation. Looks yummy. Kothu chapathi adipoli, I will try next time. if I can get any left overs. I do this quite often, just to finish my leftover chappathis,loving that bowl. very tempting and tongue tickling!!! good to clear the left over chapathis with new twist as a new dish. We make this very often at home, from left over chapati's. Delicious! Nice idea Julie. 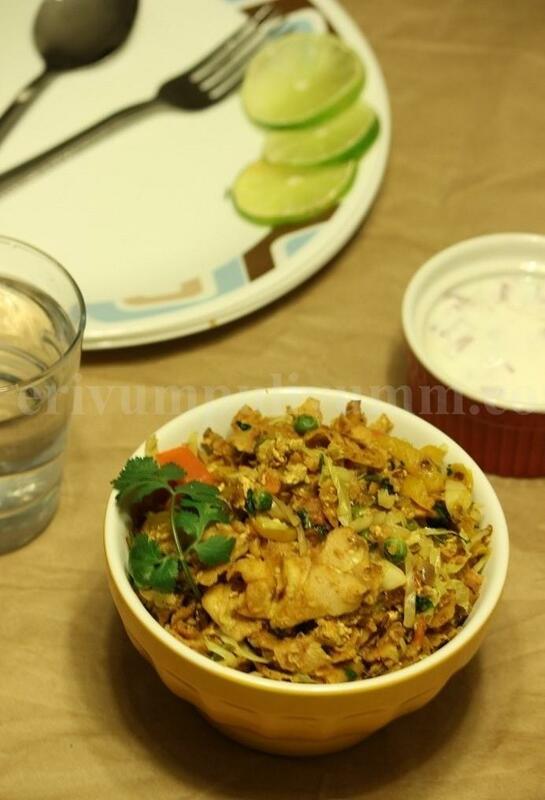 Infact this is very easy and healthy compared to kothu parotta.Lovely. pass me some. You have really jazzed it up Julie, I make it similarly too. So fun to do this with leftovers. Great job with the mixins, sounds yum! 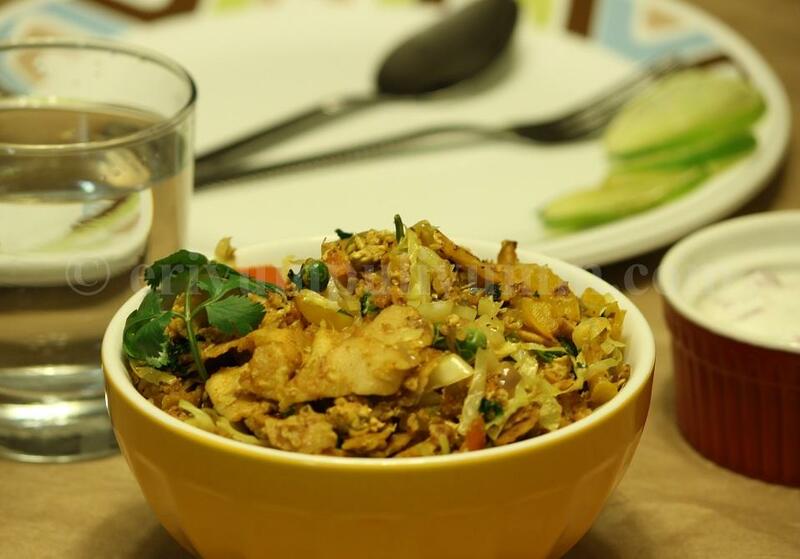 Any kothu is a mood lifter. In specific your's looks absolutely scrumptious.